You know how sometimes restaurants decide to name themselves “Best Chinese Food” or “Happy Delicious Taco Heaven”? Doesn’t it just seem like the number of accolades they bestow upon themselves directly correlates with the odds that you’ll contract E. coli just by thinking about dining at their establishment? It’s totally like that with this dish. You see…it has the word “ew” in it’s name. But I can tell you for a fact that I’ve been madly in love with pad see ew since 2005 and I have never noticed a single ew thing about it. Until, that is, I got to the part in the recipe where it said to add a splash of fish sauce (times three). At which point I had to avert my eyes and clothespin my nose shut and splash it into the pan while trying to convince myself that this step in the recipe was just a mere figment of my imagination. Because if I knew that that god-awful scent was nestled somewhere in this bowl of noodle-y goodness…I just wouldn’t be able to eat it. My psyche is weird that way. Hopefully you have no such ridiculous aversions or are at least equally as good at convincing yourself of things that aren’t true as I am. 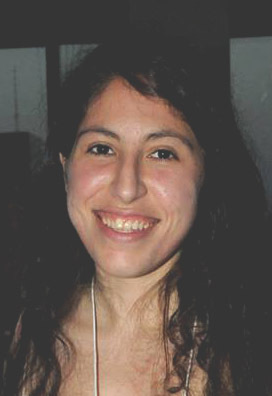 Well, here I am for better or worse! And, actually, I’m going to be so happy to see them cross that finish line. GO TEAM! And to start the celebration for them…I’m sympathy carb loading. Kind of…I’m not sure that 8 oz of pasta for four servings can be considered carb loading fo realz…but I suppose it’s carb loading lite. Totally the way I roll these days. I was so excited to see a recipe for Pad See Ew on Chez Pim, as Pim is the woman game changer in food whose recipes we are celebrating this week! This is one of my favorite Thai dishes, but I rarely order it since it’s so calorically dense. 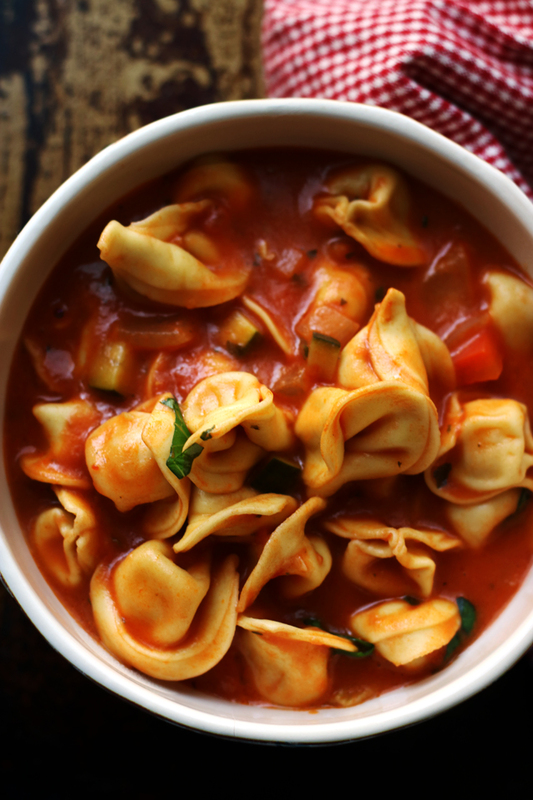 Made at home, though, it can actually be healthy as well as delicious! So if you want to support my friends in their marathoning endeavors and “carb load (lite)” as well, then you can do so without a speckle of guilt. NOTE – See bottom of post for the GIVEAWAY! 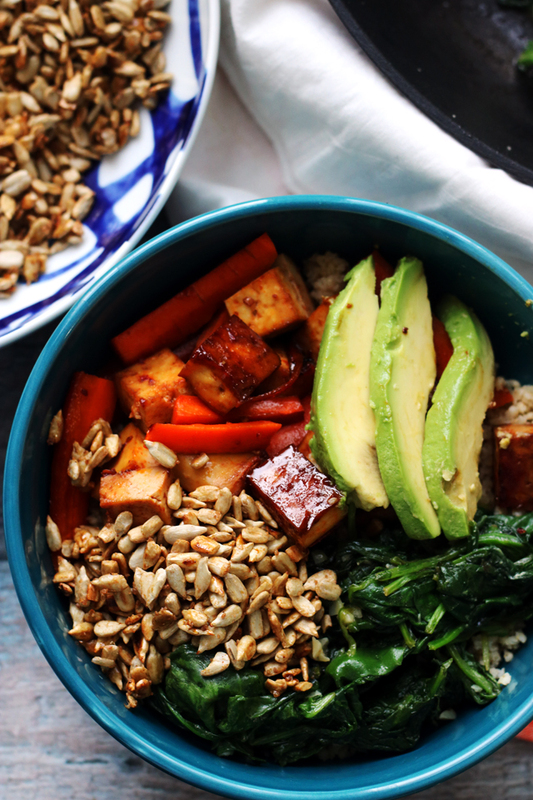 Combine the tofu, fish sauce, oyster sauce, and sesame oil in a large bowl. Allow to marinate for 15 to 30 minutes in the fridge. Heat a wok on the highest your stove will go. Add a tiny splash of oil. Throw in the broccoli and eggplant, as well as a splash of fish sauce. 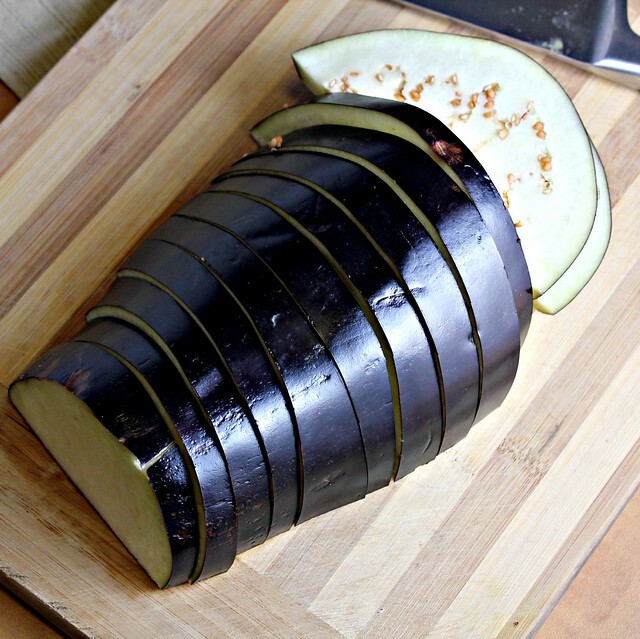 Cook, stirring frequently, until eggplant is cooked through. Remove from wok and set aside. Add another splash of oil. Add the noodles to the pan, shaking the wok a few times to coat them with oil. Add about a tbsp of soy sauce and another splash of fish sauce. Cook, stirring frequently and scraping up any charred bits, until the noodles are cooked through. Remove from pan and set aside. Add a final splash of oil, followed by the garlic and the tofu. Let the tofu char for a few seconds and then flip. When the tofu is browned on all sides, move it to the side of the pan and crack one egg in the middle. Let the egg sit for a few seconds and then stir everything together. Throw the veggies back into the pan. Stir quickly to mix, then throw the noodles back in as well. 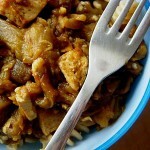 Add soy sauce and rice vinegar to taste as well as 1 tbsp brown sugar. NOTE – I realize that the fish sauce and oyster sauce don’t make this 100% vegetarian, but there are vegetarian versions of these out there, so use them as you see fit! Have you ever had Tate’s Bake Shop cookies? They’re kinda sorta the best things since sliced bread. Crispy, buttery, heavenly delicious. And the best part is, they are made from all natural ingredients! Just as cookies should be. They recently came out with a whole wheat dark chocolate cookie that they sent me to try in celebration of October being NATIONAL COOKIE MONTH…and it was a magical experience. Not only that, but they’ve offered to send one of YOU GUYS three bags of these babies as well as a copy of The Tate’s Bake Shop Cookbook, signed by the author – Kathleen King! I own this cookbook…and it’s quite lovely in every way. In addition, ALL OF YOU get a 15% discount at tatesbakeshop.com by entering in the code COOKIE. This is good through the month of October! All you have to do to enter is leave a comment (with your email address so I can contact you!) telling me what your favorite cookie is. 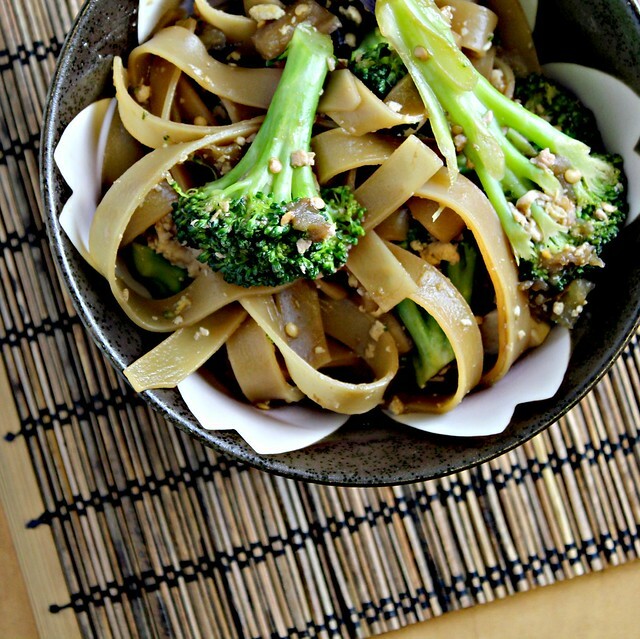 132 Responses to Pad See Ew…and a GIVEAWAY! Love it when a heavier dish is made light and delicious! As for my fav cookie, I’d have to say it’s a classic oatmeal chocolate chip! I was going to say something profound but got distracted by the lasagna tart below. Peanut butter cookies, of course! This dish looks interesting, never heard of it before. Also use of some ingredients like oyster sauce and sesame oil seem unusual for Thai dishes – I wonder if its a Chez Pim creation/innovation. My favourite cookie is a ‘free cookie’:) I am not fussed with the flavour and ingredients – pretty much love them all. I feel the same way about fish sauce – can’t stand the smell but love the taste (as long as it’s mixed with less pong-y things). And pad see EWW! is one of my fave dishes, too! WIN! My favorite cookie would be white macadamia nut. Yum! Pad see ew is my favorite thing to get at Thai restaurants. Of course, we don’t go out for Thai food since I accidentally let it slip that Thai food uses fish sauce. In the long list of things my BF doesn’t eat, fish (or “anything that comes from the ocean”) is pretty high up there. As far as cookies go, I really like soft, chewey ginger cookies. Joanne, this dish looks positively delightful. Love the crisp, bright green of the broccoli – looks so inviting! My favorite cookies are chocolate chips. Looks amazing! My kid has named a lot of things EW! Tate’s are awesome. Fave is the chocolate chip. Thin and crispy. Perfect cookie. This is my husband’s favorite Thai dish. When should we expect you over to make it? I discovered pad see ew in college and I never looked back. I still love pad thai but I order pad see ew in restaurants at least half the time. Also, looove tate’s cookies. Rob is in SF this week (for work) and I am lonely at home… and jealous he gets to be there.. while I write my personal letters… anyways. enjoy your trip to SF even if you don’t run your marathon because there are tons of things to do there (Rancho Gordo beans at the Ferry Terminal!!!). I saw this on Dawn’s blog but have never tried it…. but I have some broccoli at home and it is on sale again this week, so perhaps I’ll give this a go! Oh, and favourite cookie? I have a lovely cinnamon snap cookie on my blog that I make for Christmas… delish! A giveaway- how much fun! Count me in. I love the pad dish. So pretty and flavorful. I am not one to crave pad but you have me going on it this morning for sure! My favorite cookie is oatmeal raisin. The dark chocolate cookies look awesome though! My favorite cookie is Chocolate chip oatmeal! These look great! That is hilarious. I have to hide the bottle of fish sauce from my husbands eyes. As much as he likes Asian food he can’t stand the smell of fish sauce. I am not vegetarian and happen to LOVE seafood more than life itself and fish sauce still gives me the hee-bee jee-bees. And then there’s the fact that it’s shelf-stable before being opened…ew. 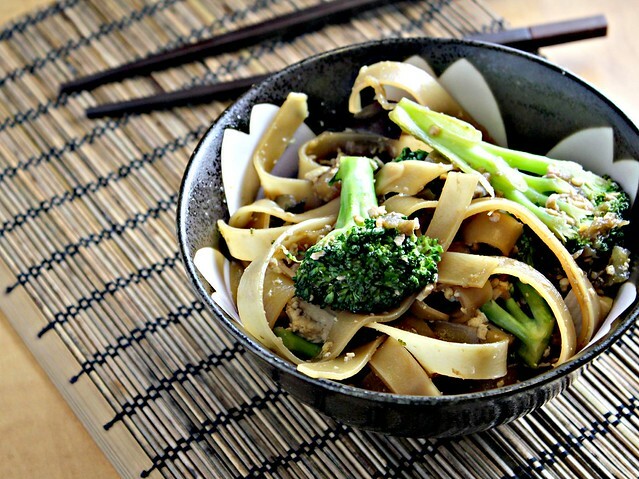 That’s the only “ew” that comes to mind, but the pad see ew….YUM! Looks delicious! And my favorite cookie….White Chocolate Chip Cranberry as of this very moment. But that changes on a near hourly basis. 🙂 Love Tate’s! My favorite is my Mom’s chocolate crinkle cookies, my ex wife could make them okay but now I am back to waiting on Mom again. Sympathy carb-loading… that’s something I can believe in! I can’t do fish sauce either. I KNOW that it is good in recipes but I just can’t bring myself to buy it. Oyster sauce is the same way, it doesn’t smell but it’s just a mental thing. When I found out that Worcestershire sauce has fish in it, I freaked out. Now, I just hold my hands over my eyes and sing, “la,la,la, not thinking about the fish…” as I’m using it. Don’t like the name of this either but I’m sure it’s good, I LOVE asian food! Cookie? Snickerdoodles would have to make the top of the list. Or Macaroons, is that a cookie? The idea of fish sauce definitely sounds interesting… not sure what else I’d ever use it for, though! Mmm.. favorite cookie? Because it’s October I’d have to go with Pumpkin Chocolate Chip at the moment! Yum! cookies = not ew. same goes for this dish. yum! my favorite cookie? oatmeal raisin, or any variety of oatmeal-y cookie with lots of stuff in it. yum. I love the way you write! I haven’t quite found my “food voice” yet….anywho, my favorite cookies are white chocolate chunk cookies…or maybe golden oreos. Those are my new found love. YUM! All of these “pad” names create an illusion of something not as amazing as they turn out to be, I think. This definitely does not sound ew, I will be trying it! Oh man, I love anything with good, dark chocolate, but I have to say that a good peanut butter cookie can hardly be beat. This dish looks amazing! My favorite cookies will be pineapple tart with buttery crust and sweet tangy filling..
Looks like a great side dish, and healthy as well! Richard from Amish Stories. I love pad see ew! My fave cookie is oatmeal raisin! I also asked that one time why there’s a “ew” at the end. Definitely not an EW as this counts as one of my Thai favorite dishes too. 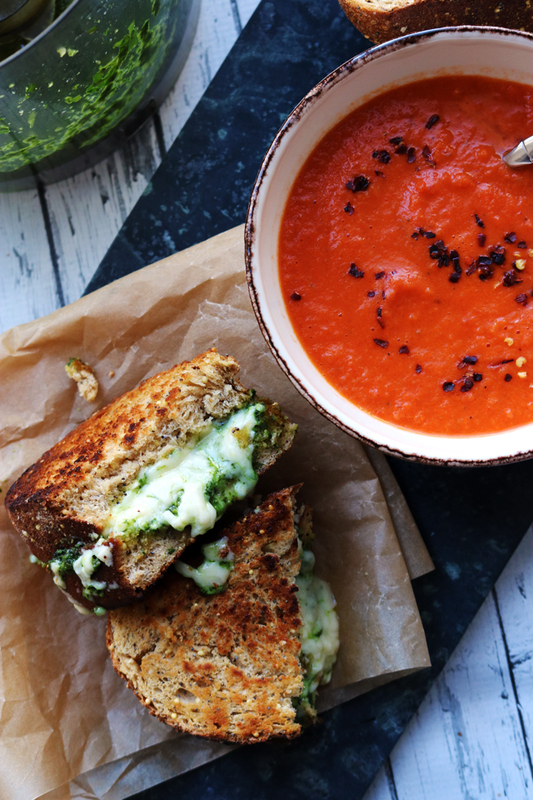 I never cooked this before, would love to have it for lunch today. And yay, giveaway, my favorite cookie is chocolate crinkles.. yum! Mmm. The Pad See Ew looks very good. Will have to try it. Looks like something my kids would love too. My favorite cookie? Hmmm. That’s a tough one. I adore bakery butter cookies, classic chocolate chip cookies, spice cookies … Well, okay, it could be said that I’ve never met a cookie I didn’t like. My favorite cookie (boring, I know) is a super plump choc chip cookie. I love all sorts of funkier varieties but you can never go wrong with a classic! I love pad see ew, and I always order it at our favorite Thai place here in town (Siam Noodle & Rice). I even made it at home a couple times and found Chinese broccoli to use–delicious. I wouldn’t mind a bowl of this for lunch in about 2 hours. Mmm! And as for my favorite cookie, SHORTBREAD!! Shortbread all the way. I like oatmeal raisin cookies and peanut butter cookies. ps- favorite cookie? peanut butter. I’ve been having an “affair” with Thai food for about fifteen years now and have a favorite restaurant and adore the owners!! This is one of my favorite dishes and I know how fish sauce marries with other Thai flavors to produce a delicious dish. Sweet, salty, sour and spicy are the name of the game for me. I’d have to say my favorite cookie is chocolate chip but there are many others and close second, third…….etc. ah! coookies! i’ve been living over here in germany for 3 years and i miss other people making good cookies. today i made my favorite cookie – my busha’s soft n chewy ginger bread. perfect for this rainy fall weather over here. Welcome to sunny San Francisco! You hit great weather, as we were just up there last Sunday. I had to laugh at the fish sauce aversion. The first time I used it, I almost gagged. (Note to self: never, ever sniff the bottle.) Somehow, it does transform into great flavors, doesn’t it? LOVED the shot of the eggplant. I don’t like eggplant, but I admire how photogenic they are. HOWEVER, I will eat eggplant. I’m hoping, one day, to fall in-love with. Mr. Broccoli, however, works for me. I’ve got a Tate’s giveaway to do, so count me out and we’ll let a Tate’s virgin win these great cookies. I love restaurants with wacky names like that. There’s a plethora of them in my neighborhood. This is a dish i’ve never tried but now I’m intent to make it at home! I think I missed something – are you in San Francisco? wow, anything thai and I am in. Love your pad see kew. I love any cookie as long as it’s without pecans or walnuts (I’m allergic)…but I generally prefer crisp-at-edges, chewy-interior cookies. Thnk you for this giveaway! Nothing ew about this recipe! Looks amazing! Favorite cookie? Tie between chocolate chip and my grandma’s gingerbread cookie recipe. Flourless peanut butter cookies are also pretty up there for me. Pad See Ew is one of my favorite dishes to order when go out for Thai. So funny, about the fish sauce! I think they should rename this dish!! It looks delish and wonderful in every way! My daughter is a big fan of Tates as am I. We have tried many of their oatmeal raisin cookies. I have also given them as gifts to friends. I would love enter your giveaway! I love a good thick chocolate chip cookie! delicious, I substitute fish sauce with soy sauce I know, I am cheating, but i can’t help it. cookie giveaway sounds nice. I’ll carb-load-lite with you, I love thai food! And I totally know what you mean about silly restaurant names. How about TownName Gourmet? Does that sound like a Chinese restaurant you’d ever want to eat in? I am assuming you mean the Nike Women’s Marathon… cool that you are going to watch your friends! There are about 45 MS2s from UCD running (including myself). You’ll probably see us in our blue shirts that say “Don’t trust us, we’re not doctors yet!” haha! I am the same way with fish sauce. The dish looks fantastic. Love Tate’s cookies! 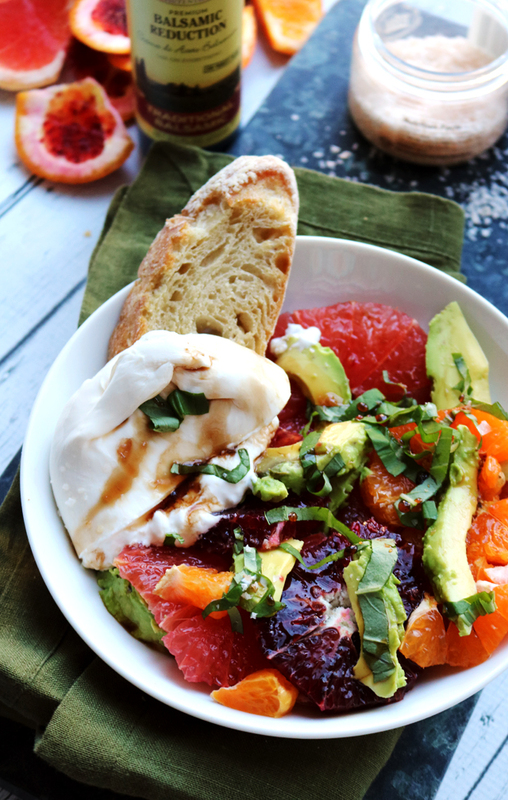 I am an MS3 at florida and i always thought i was doing pretty good by cooking/eating healthy and continuing to exercise while in med school but you amaze me with the time it must take to blog this stuff. I’d love to enter! This cookbook looks amazing. And my favorite cookie is a ginger snap! Oh my. I may need to make some cookies now. Gotta love language. Nothing Ew about it to me either. 🙂 Looks amazing! This dish looks so delicious and boy those coolies sound awesome!! My favorite cookies changes with the seasons, but I think right now I’d choose Molasses. My Nana’s no-bake oatmeal peanut butter chocolate cookies. I’ve been dying for Chinese food! This looks better (and much healthier) than anything I could order out…and you’re so right about some restaurant names, lol! I’m pretty sure this would be my favorite way to load up on carbs. And I’m totally ok with fish sauce, so bring it on!! Love the ingredients in the ew dish. Fish sauce is necessary even if it is stinky. Would love the cookies and book. My favorite cookie is white chocolate chip pecan. I heard so much about these cookies, I would love to try them. So hard to choose a favorite cookie because I’m a fan of most of them, but I’ll ALWAYS take a warm chocolate chip cookie with a glass of milk! I love Thai food as well. And I like to sprinkle a few chopped peanuts on top at the end. 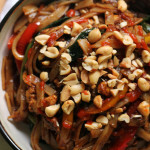 I think I’m going to make Thai noodles this weekend now! Mmm…I love pad see ew! We haven’t been able to find a good Thai place in our new neighborhood, so I think I’m going to have to start making it more at home. This recipe would be a good start. I absolutely love pad see ew… but never thought to make it at home. totally using this recipe from now on! Love your take on the name….there’s a Chinese dish I love called Chow Dun. I always giggle inside when I order it (my age notwithstanding). You can’t help it but the waiter never cracks a smile. Great example from Pim, Joanne! Vegetarian fish sauce is the best thing that ever happened to me! It’s not EXACTLY the same, but close enough! I admire your passion and perseverance for the healthy and delicious food. The noodle looks delectable! Ooooh, I LOVE pad see ew…definitely one of my favorites at Thai restaurants. I LOVE the noodles, way better than pad thai noodles! Oh my gosh, I read the title of your post too fast and thought you were having an iPad giveaway. There is nothing that looks ew about this recipe either 🙂 I hate how fish sauce smells but love how it flavors dishes like this. Have a wonderful time in San Fran! Love that city. I just made this dish and it was delish! We loved it and we’ll be making it more often from now one. My fave cookie would have to be the ANZAC cookies! I love the stuff in stir-fries and even Caesar dressing. Pad see ew is my favorite Thai noodle dish, better than the pad Thai. 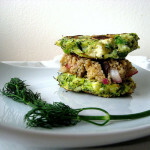 Pim’s recipe is one of the best version I;ve come across. I love Pad See Ew, I tried to make it once and it was a total flop. Anyway, my favorite cookie is peanut butter chocolate chip! My favorite cookie is oatmeal chocolate chip with coconut. Wonderful dish and I love the pictures!My favorite cookies are Alfajores. I am a sucker for oatmeal raisin cookies… with or without chocolate chips. Thanks for doing this giveaway my dear! Those look like yummy cookies indeed!! On a pleasanter note, I also love cookies! My favorites are gingersnaps. Dare Maple Leaf Creme cookies are THE best store-bought non-chocolate cookies ever. I am a chocoHOLIC, and I would seriously pick these cookies over chocolate ones any day (bold statement right there). My favorite cookie is definitely no-bakes! Super!’i have yet to cook with these types of pasta. I love dry and crunchy cookies like biscottis. mmmmm that dish looks delicious. as do the cookies! My favorite cookie is an italian chocolate cookie that I used to pay $10/lb for at the local bakery but then my mom and I spent a good part of the weekend trying to mimic the recipe and were successful after only 2 attempts! 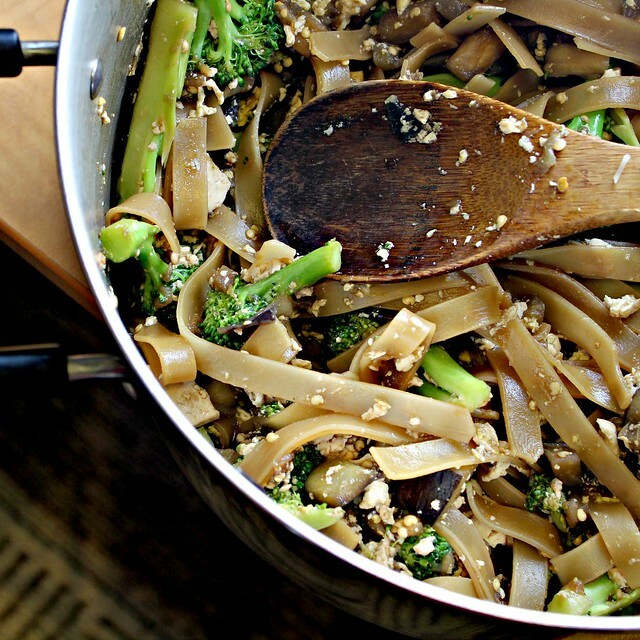 And Pad see-ew is my FAVORITE thai dish….yum-o! Beautiful, healthy-looking dish — gorgeous broccali and eggplant. I’ve never met a “Pad [fill in the blank]” dish that I didn’t like, but yours is esp. yummy. Shortbread cookies are my favorite, as they’re easy to make and almost universally loved. Kind of a cross between sugar and savory; and when there are no eggs on hand, you can still make shortbread and please your guests. Erma Rombauer’s recipe is the best. Hmm I think my favorite cookie has to be the cookies n cream cookie at Anthony’s Cookies. Love your recipes. I’ve made quite a few, and each one has been very well received by my guests. Thanks for the good work. I would sign up to eat at Chez Joanne any day. This is my favorite Thai noodle dish. Yours look great! I’ve never had Pad See Ew, but this looks wonderful for “carb loading lite.” 🙂 And my favorite cookie? Why a chewy soft ginger cookie, of course! I looooove pad see ew! Now that I know its so easy to make, its definitely going to be on the menu this week. My favorite cookies (which I’d never had before moving to New York) are Black and White cookies! So yummy! I have heard vegetarian versions of fish sauce and oyster sauce too but I don’t think they match up to the non-vegetarian sauces. In some cases, they may even make food taste ….urghhh! Joanne, that broccoli looks fantastic. You just made me add broccoli to my meal plan for the week. The color made me smile and now I’m craving it. Thanks! Oh, and whole wheat chocolate chip cookies pretty much are my favorite cookie of all time. I love lemon cookies too, but the chocolate always trumps it. Your dish looks great!! I am going to try & make this sometime this week. My favorite cookie is chocolate chocolate chip. mmmmm, cookies! My favorite…it’s so hard to choose – oatmeal with dark chocolate chunks & toasted pecans? Ohhh, now I want some! Fish sauce. Ahem. I don’t cook much Asian food at all, but my cousin convinced to try one of his recipes and it called for fish sauce. I bought it, used it… .and was good!! I hold my breath when I pour in the fish sauce too. It does do wonders for a dish, but smells terrible going in! 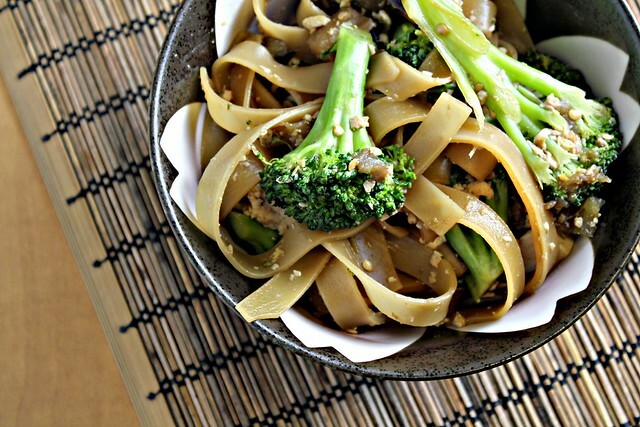 The pad see ew looks very tasty indeed. ? Love Pad See Ew, but I have never added eggplant to it. Sounds good. 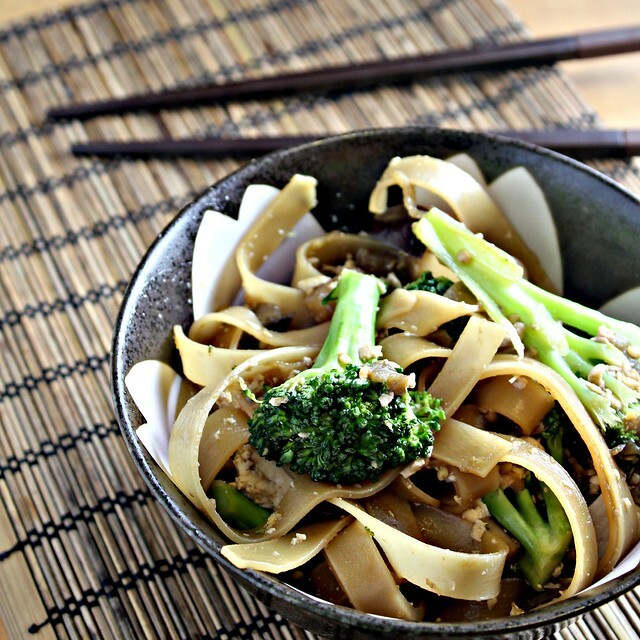 I almost always order Pad See Ew and just bought the big flat noodles to make it – I’ll have to try this recipe! 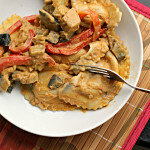 Yumm your pad see ew looks so good. I love your giant broccoli pieces. I actually tried this dish for the first time last year and fell in love with it. I need to find a good fish sauce free version!